Home » Ballpoint Pens » Pen Trivia » Writing Instrument » Pen Trivia : How many ball point pen are manufactured each year? 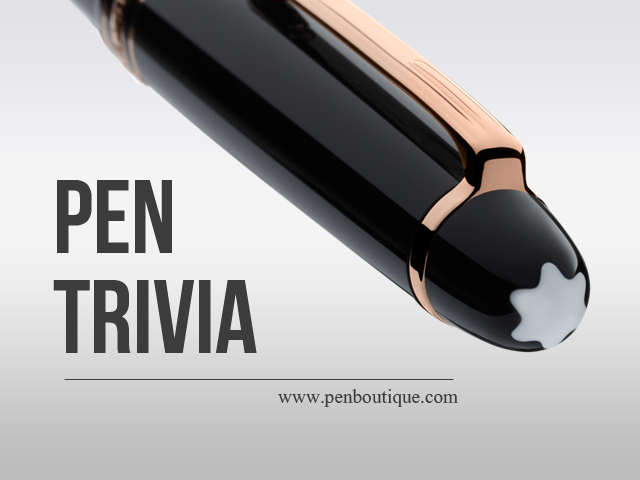 Pen Trivia : How many ball point pen are manufactured each year? The principle of the ballpoint pen dates from the late 19th Century when patents were taken out by John Loud in 1888 for a product to mark leather and in 1916 by Van Vechten Riesberg. However neither of these patents was exploited commercially. The modern version of ball point pen was invented by Josef (Lazlo) and Georg Biro. In the summer of 1943 the first commercial models were made. The rights to Lazlo's patent were bought by the British Government. The ball point pen is more rugged than the fountain pen which may be why sales rocketed during World War II when the military needed robust writing implements to survive the battlefield environment. The ballpoint pens was introduced to the U.S. market. The pen was sold for $9.75 each. Some 10,000 were sold at the launch at Gimbel's department store in New York on October 29th 1945. Ball points were originally conceived and developed as a cleaner and more reliable alternative to quill fountain pens and are now the world's most-used writing instrument. Millions are manufactured and sold daily. As a result, it has influenced art and graphic design and spawned an artwork genre. Q. How many ball point pen are manufactured each year? Answer: Over three billion ball point pens are manufactured each year in a variety of styles, point sizes, materials and colors.